You may have heard about buying long-term care insurance. This insurance helps cover the costs of a care facility outside the home or even nursing care inside of your home. 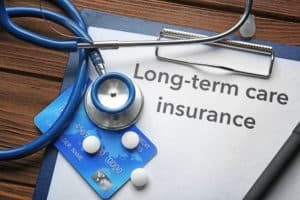 There are a few pros and cons of long-term care insurance that you should consider before investing in a policy. Long-term care (LTC) insurance can save you and your family a lot of money if you or your spouse unexpectedly needs extensive care. Some skilled nursing facilities or other care facilities do not take Medicaid. They require private payment, and most people’s private health insurance will not cover all or most of the cost. In contrast, LTC insurance plans often will pay for in-home nursing. Most LTC benefits do not expose you to tax liability. They are not counted as income when received. Some medical costs may be deductible from federal income taxes. The cost of LTC is a big obstacle for some families. It costs a lot more than other insurance products. If you believe there is a high likelihood that you will need long-term care, however, the risk is lower. It can be difficult to qualify for a LTC insurance plan. Many insurance companies require a physical examination, and coverage may be denied if you have pre-existing health conditions. In particular, some companies deny coverage for people with multiple sclerosis. Other downsides include a waiting period before benefits kick in, potential premium increases, and limitations on covered care facilities. The Medicaid “five-year look-back” period requires you to report all gifts, sales, or transfers of property in the last five years before you apply for benefits. The idea is that Medicaid does not want people giving away all their assets so they meet the Medicaid eligibility requirements. However, as parents of a child with special needs you can take advantage of a permitted exception to this rule. You and your spouse (or anyone else) can make gifts to a Special Needs Trust (SNT) and, so long as certain very specific language is in the trust, it will not count toward the five-year look-back period for your own Medicaid eligibility. Once this gift happens, the assets can only be used for the benefit of the child with special needs during their lifetime. On their passing, however; the remaining gifted assets could generally go to other family members under the current rules in Illinois.